In my three-year tenure thus far at CPS Energy, I’ve received a great deal of valuable feedback, and lots of good questions from the community. One of those questions has been about the fuel adjustment charge. As with many questions in our industry, the answer is complicated. That particular line item on CPS Energy bills makes up for the difference between what the utility allots for fuel within the base rate, and the variation in fuel costs and types actually used each month. Because some have asked to see a breakdown of those costs, CPS Energy will now publish that information on its website each month. Increased transparency, when possible, has been a CPS Energy goal since my arrival. Starting in September, we will share what percentage of the fuel adjustment cost comes from the power we generate, renewables, the STEP program and, when applicable, what we buy from the open market. Beginning in September, CPS Energy will now post a breakdown of the fuel adjustment charge each month on its website. For example, our energy market operations group estimated that for the month of August, CPS Energy would use roughly 32 percent nuclear power, 49 percent coal, 10 percent natural gas, 9 percent wind and slightly more than half of one percent of solar power. Using current costs for each power source, analysts then calculate the overall fuel adjustment charge. By breaking down the components of the fuel adjustment charge, customers will now be able to see what percentage goes to renewable costs. CPS Energy was recenty challenged by the San Antonio Express-News Editorial Board for not releasing the price it pays for specific renewable contracts; non-disclosure agreements with our partner companies prevent us from doing so. The challenge is a fair one, however, and going forward, CPS Energy will work with the private companies we partner with to craft agreements that are more transparent and would allow us the latitude to share the costs we’re incurring. We can also, as we have in the past, share the cost of our renewable contracts in the aggregate. In August, for example, CPS Energy paid, per kilowatt hour, five and a half cents for wind and eight cents for a blend of solar power, landfill gas and power purchased on the wholesale market. We paid four cents for natural gas, two cents for coal and a half cent for nuclear power. Renewable power is more expensive than traditional fuels, and it makes up just a fraction of our overall generation portfolio. But renewables are also a hedge against future, and I believe certain, increased federal regulations on pollution emissions. Renewables are not only emission-free, they also use zero water for production — an increasingly relevant factor here in South Texas. Solar in particular is incredibly valuable for CPS Energy, in that it is generating when we need it most, during hot afternoons when the demand for power, and thus its cost, can rise exponentially. 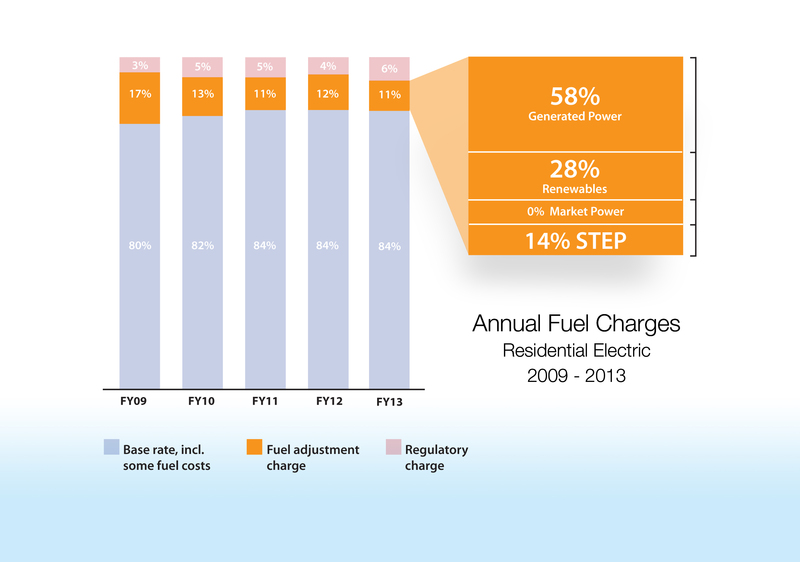 In fiscal year 2009, renewables made up 20 percent of the total fuel adjustment cost. By last year, that amount had risen to 28 percent. In comparison, power generated by CPS Energy’s nuclear, coal and natural gas plants made up about 60 percent of fuel adjustment costs in the last five years; that amount is projected to shrink to 45 percent by 2018. STEP program costs are also included in the fuel adjustment charge. By saving 771 MW of power by 2020, CPS Energy will be able to delay building or purchasing its next fossil fuel plant — and that saves customers money. We’re doing that by offering rebates on efficient lighting, heating and cooling, weatherization and using demand response programs to decrease peak load. The City Council in 2009 approved STEP and its funding mechanism – CPS Energy must certify, through a third-party, the amount of energy it has saved each year, which can then be recouped through the fuel adjustment charge. The utility business is a complicated one, but it’s important to me that our community understands what goes into calculating a monthly bill. I encourage you to reach out with any questions or concerns you might have, either by leaving a comment below, through our social media channels, attending one of our upcoming Customer Care Fairs or public input session. Correction, Sept. 24, 2013: An earlier version of the graphic, above, misstated the makeup of the blue portion of each bar. It is the total base rate, including some fuel costs, not the fuel costs portion of the base rate. Does a customer with 98% power factor get any break than a customer whose power factor is 74%? In other words, is there any incentive for better power factor correction? I know what a power factor is, but unclear how you’re using it in this context — ie, a customer’s power factor. Can you elaborate? Til then I can’t answer definitively, but I can tell you that residential customers pay the same rate, regardless of how much power they USE, unlike some utilities which have tiered rates, with higher users paying more. Does that help? I have noticed some utility companies apply a power factor penalty in the Fuel or distribution adjustment though it is not stated on this bill. The KVAr surcharges become a hiddden cost on the bill. Does the CPS has a power factor surcharge for either residential or commercial clients? Our Commercial and Industrial Electric Rate Schedules all contain the language below with regards to power factor. Our residential rates do not have any power factor penalties. When, based on a test of the Customer’s power factor, the power factor is below 85% lagging, the Billing Demand may be increased by adding 1% of the Actual Demand for each 1% that the power factor is below 85%. Isn’t there a danger of losing our historical rate advantage over competing providers by loading up on high cost renewable energy sources, while non-green providers are taking advantage of lower cost power sources? Isn’t natural gas an affordable clean fuel in abundance and currently available on a long term basis less expensive than renewables? Other than the gas plant CPS purchased, any other future plans involving natural gas plant? Yes to your questions — natural gas is abundant, available and less expensive than renewables, which is why CPS Energy bought the 800 mw natural gas plant last year. There are no immediate plans for additional generation, because with Rio Nogales, CPS Energy is currently considered “long” on generation. That means we have more than we need, and can sell the additional into the market — which also helps keeps rates low. Eventually, CPS Energy will have to make its next generation decision, and will analyze not only today’s fuel mix, but will look out 50-100 years. Yes, supplier defaulted on contracted price of gas; but even at higher market price gas was still cheapest source of power considering cost of conversion to oil fuel on existing plants or new coal plant or South Texas Project. Diversification was caused by Arab Oil Embargo and Congress prohibiting the use of natural gas as boiler fuel at a future date. That is when, per force, CPS converted gas plants to oil, started South Texas Project and Coal plant. This forced diversification and accompanying borrowing costs was the real driver of the dramatic rate increase requirements. This was a critical period nationally for U.S. Utilities and not just local. CPS still came through with even lower comparative rates than we enjoy now..